Somewhere in the Midlands, there is an inner-city apartment building called Shenstone Towers. The residents of this social housing building comprise a cross-section of humanity. So, lets get right down to it and meet a few of them. Ella – At just twenty-one years of age, Ella is a new resident of Shenstone Towers. She is heavily pregnant and has been recently living on the streets. She is a smoker and an alcoholic. Now, she is valiantly trying to turn her life around so that she can be a good mother. Ella is very beautiful with an infectious smile. With no support system, she is trying to get to know her new neighbours. Ella lives next-door to Aggie. Nathan – Young and handsome, Nathan is a wedding videographer. He is also very lonely since the death of his Mum who he was very close to. He is single because he doesn’t want to inflict his ‘baggage’ on another person. In addition to hallucinations, he has night terrors. Both of these things have Nathan’s guilty secret as their cause… When Nathan meets Ella, he is drawn to her beauty and recognizes her as a kindred solitary soul. Birdie – Having just passed her 52nd birthday, Birdie is a lonely, tragic woman. She is estranged from her married daughter and is now jobless. She fancies herself an actress, but acting jobs for a woman of her age are few on the ground – even though she has kept her trim figure. She suffers terribly from arthritis in her knees and drinks copious amounts of wine in order to feel better… both emotionally and physically. William – A young man in his twenties. He is autistic and this is the first time he has ever lived on his own. His mother is worried he will not be able to manage, but William is determined to strike out on his own. He has just moved in to Shenstone Towers. William loves to watch people and sometimes makes up stories about them. Unfortunately, he isn’t always able to discern fantasy from reality. The others wonder if William’s astute observational skills are to be fully trusted. These residents band together to play detective. They want to discover who attacked Aggie so viciously. Their discovery will surprise them all. Though I seldom agree to blog tours, I just couldn’t resist taking part in this one. A few years ago I read the novella “Homecoming” by Tanya Bullock which has remained in my memory every since. So, when Blackbird Digital Books asked if I wanted to join the tour, my answer was a resounding YES! I loved the way that the misfits and loners of “The Lonely Hearts Crime Club” came together. Their burgeoning friendships were heartwarming, all the more so because they lived in a place where tragedy and heartbreak abound. The book portrays vulnerable people who have had their trust in others betrayed time and again. It vividly depicts how complicated and interesting people can be, and how a sense of belonging can be extremely cathartic. It also shows how ordinary people’s lives can be derailed – and how difficult it can sometimes be to get back on track. All in all, “The Lonely Hearts Crime Club” is a novel I can heartily recommend. Tomorrow, April 16, 2019 is publication day for “The Lonely Hearts Crime Club” so be sure to pick up a copy! Thanks so much to Blackbird Digital Books who provided me with a complimentary digital copy of the book in order that I could take part in this tour. Tanya Bullock is an award-winning filmmaker, writer, college lecturer, and the mother of two young children. She lives in the West Midlands, England. 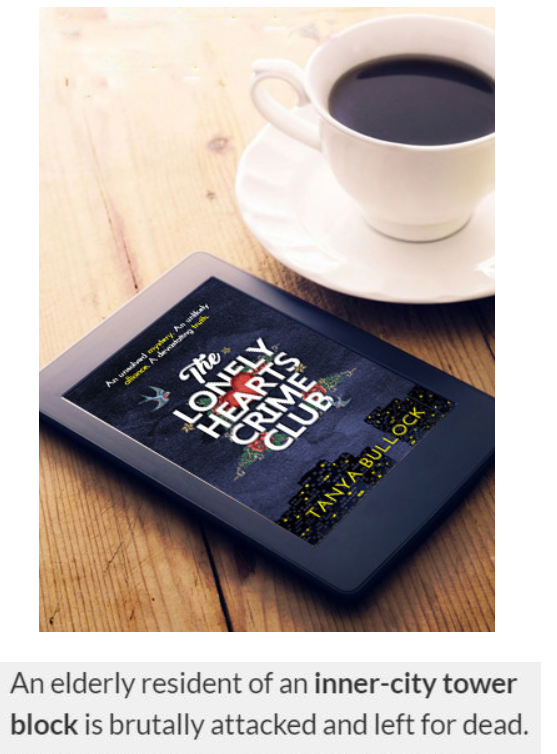 The Lonely Hearts Crime Club is Tanya’s third novel.